Doctor, attendees consider: Which Brain Do You Want? 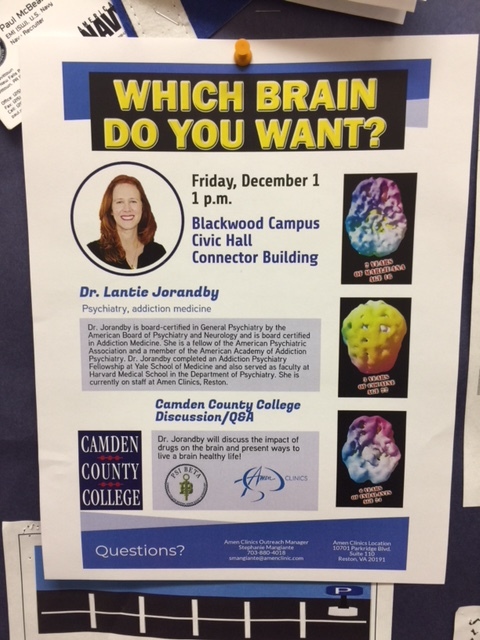 BLACKWOOD – A Virginia-based psychiatrist presented Which Brain Do You Want?, a program about brain health, to an audience in Civic Hall at Camden County College on Dec. 1. Jorandby began the program by giving out basic facts about the human brain: For example, your brain controls everything you do from working in school to building relationships with people. Your brain has 100 billion cells or neurons and is made up of 60 percent fat. Your brain does not stop growing until age 25 to 27 for men and age 21 to 24 for women. And the brain weighs as much as a miniature or teacup chihuahua. Jorandby then discussed the functions of the different parts of the brain: For example, the temporal lobe helps with memory and language, keeps you calm and prevents you from being grumpy or cranky. The prefrontal cortex makes up your personality, helps you focus in school and is considered the brake of your brain. In other words, the prefrontal cortex prevents you from making poor choices such as saying something illogical. She said a healthy brain is smooth, rounded, symmetric and has no holes, dents or gaps, while an unhealthy brain is bumpy with holes or dents on it. She said these holes are areas in the brain where blood circulation is extremely low. Compulsive addicts are always worried, over-focused and have trouble letting go. Impulsive addicts are constantly bored, easily distracted, impulsive and inattentive. Impulsive-compulsive addicts have a mixture of compulsive and impulsive traits. This pattern is usually found in children of alcoholics. Sad or emotional addicts are depressed, often crave sugar, have low energy and use food, alcohol or painkillers to overcome loneliness and boredom. Anxious addicts predict the worst outcomes and have feelings of nervousness, tension, fear or anxiety. Temporal lobe addicts have problems dealing with their temper or anger, go through mood swings and have learning disabilities. Toward the end of the program, Jorandby gave the audience information about keeping your brain healthy: For example, you should aim for 7.5 hours of sleep each night in a cool dark room with electronics turned off. You should eat well by consuming healthy fats such as organic poultry, seeds, grass-fed beef and lamb and cutting out sugar, alcohol and genetically modified or processed foods because they slow your brain.